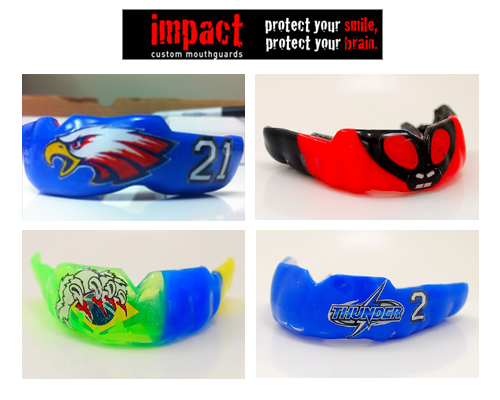 The Drexel Hill Raiders have become an affiliate of Impact Mouth Guards with a small portion of each sale when clicked through our website. Lacrosse is fast moving sport with big crunchy hits. Whether you’re playing with girls or guys you stand the risk of taking a stick to the head. It’s what makes the game exciting and you love it! But any player knows you gotta have the right equipment to make it through safely. So whether you’re on the turf or you’re in the dirt playing 7 v 7 you can play with confidence when you have an Impact Custom Mouth guard in your mouth. When you take the big hit, your smile and brain are protected. And you can laugh and call it one heck of a game. For Lacrosse we recommend our mouth guard with a 5 Mil thickness. It’ll get you through the toughest battle and won’t impede your breathing or jawing along the way. Let your imagination go WILD ... almost anything goes when customizing your new mouth guard. Click here to check out their offering and buy a custom mouth guard today.